Menzie Lipson was a chemist who specialised in wool research. He worked mainly with CSIR/CSIRO, was the Officer-in-Charge of the Geelong Wool Textile Research Laboratory from 1950 to 1958 and when it achieved Divisional status was the Foundation Chief of the Division of Textile Industry from 1958 to 1976. Menzie (Pip) Lipson was born in Sydney on 15 February 1915 to parents Bernard Lipson and Clara Rosenberg. Raised from humble beginnings, he applied himself to his studies at Sydney Boys’ High School and went on to win a scholarship to the University of Sydney where he obtained his BSc in 1935. He obtained his PhD in 1948 from Leeds University with Professor JB Speakman, an internationally recognised leader in wool textile research, as his supervisor. The topic was on the application of polymers to wool. I worked on various aspects of textile production, mainly chemical treatments in wool processing. We experimented with various processes for shrink-proofing hand knitting yarns, settling on a method of treating wool with a pretty noxious chemical in white spirit as solvent which involved wearing protective clothing. The conditions we used would never have been passed these days by health authorities. The results on shrink resistance were very good although there was some loss in weight of wool during treatment. The job prospects weren’t promising and I saw advertised a job in the CSIR Division of Animal Health and Nutrition. I joined CSIR at the McMaster laboratory in Sydney University grounds. You got free laboratory coats, a minor thing but that impressed me and the laboratory was luxurious compared with what I was used to. I initially concentrated on chemistry of the fleece of sheep and what attracted blowflies to the fleece. This involved analytical work on the fleece of sheep we knew were susceptible to blowfly, compared to sheep in the same flock that were not. I thought we might do some work on shrink-proofing as a sideline, which I suggested to my senior and he agreed. What resulted in reasonably quick time was a process that might control shrinkage in wool. After giving squares of fabric severe pummelling in soap and washing powder, it hardly changed. The first ones were really over-treated, so then we had to work on reducing the concentrations we were using to have milder treatment. We had to convince the CSIR Executive that this was something worth following. We had to overcome quite a lot of resistance from them because CSIR wasn’t supposed to be doing research in the secondary industry area, only primary production. Finally we managed to get them to take out a provisional patent which they probably had never done before. We didn’t know we were going to create such turmoil. This shrinkproofing research was done in collaboration with Martin Freney and the industrially successful method, the Freney-Lipson process, was the subject of the first patent application ever made by CSIR. They were given a temporary agreement by the CSIR Executive to go ahead and bring the work up to a stage where it could be handed over to the Wool Industries Research Association (WIRA) in England, which did such research. We remained in Sydney as part of the Division of Industrial Chemistry, in temporary space in the National Standards Laboratory at Sydney University. We developed the shrink-proofing process further, putting different structures of woollen fabric through washing machine tests. A technical officer and I brought it to a stage where we felt it was suitable for trying on socks as the Army was using pure wool socks in those days. We made contact with the Chief Chemist of Holeproof Hosiery in Melbourne and together developed the process to the stage where he decided to apply it to Holeproof socks. The US Army then tested it and approved it for use and that’s how we got it well and truly recognised. WIRA, to whom we had sent the original information, didn’t seem very enthusiastic about it. Tootal Broadhurst Lee in England took out a patent on a process using alkali in organic solvent where we were using alcoholic alkali and inter alia it covered our process. Holeproof was in a position where they couldn’t apply this process without paying royalties to Tootal Broadhurst Lee. It was decided that Holeproof and the Australian Wool Board would contest the Tootal patent and RG Menzies, who was then Leader of the Opposition, was our senior legal counsel. Through experimentation we proved that Tootal had not improved on our process as alleged and there was no point in using their modifications of our process. Holeproof could therefore use our process free of charge. If the CSIR Executive had not let the provisional patent lapse this would not have happened. We were shocked and disappointed and it had a little bit to do with my resignation from CSIR later. In 1941, Lipson left CSIR and accepted a position as a chemist with the Central Wool Committee in Melbourne. There he teamed up with his former colleague Martin Freney and worked on fleece testing and appraisal until 1945. They developed tests for ‘yield’ (the amount of pure wool in the fleece) and the content of vegetable matter tackling many problems in wartime storage and appraisement of the wool clip. During this period he also worked on sheep branding fluids which were a major problem at the time. The Central Wool Committee was established by the Australian Government in 1939 to acquire the Australian wool clip and sell it to the British government. It was replaced by the Australian Wool Realisation Commission in November 1945. I was fortunate to meet Professor Speakman, who was the Head of the Textile Department at Leeds University. He came out to Australia as a member of a group of four overseas experts at the invitation of the Federal Government, to advise on wool textile research. It was VJ Day, when the Japanese surrendered, when he visited us at the testing house in Sydney, and asked me what I now wanted to do. I told him that I wouldn’t mind working with him. He had a Research Fellowship available in his department and asked me to write an application to take back with him. Fairly soon after, I received a cable from him, advising I got this Fellowship and asking me to go over as soon as possible. I only had a pass BSc but that didn’t worry Speakman. I got my PhD in two years because I published a lot and had a lot of research experience. I could never have done that at Sydney. Speakman had developed with some fellow workers, a method of forming polymers in wool fibres and now wanted it done in a simpler way. We found a way to do it and produced several papers and received inquiries from people working on other fibres showing great interest. My external examiner was Head of the British Leather Research in London whom I knew from his previous work at WIRA. When we met for the external exam he had read my thesis and the only question he asked was, “Has it got any application to leather?” That was my external exam; really very easy. Speakman wanted me to apply this in a mill but I was not keen as a lot of development would have been needed to make our laboratory technique acceptable to industry. I had no obligation to return to CSIR but I was obliged to return to Australia by the Wool Board who had paid my fare to England. The Head of the International Wool Secretariat in London, whose main contributor was the Wool Board in Australia offered me a job in their New York office as a technical liaison person in the American textile industry. It was attractive financially and the Wool Board agreed to forego the need for me to return to Australia if I accepted this job. I wrote to Clunies Ross, who I knew and who was on the CSIR Executive. He told me not to do anything as he was coming to London. He offered me a research position in Geelong. I wasn’t happy because the salary was very meagre compared with what I’d get in the US or compared to what I was getting at the Central Wool Committee, but he was a very persuasive man for whom I had a high regard. I returned to Australia in 1948 to start the Wool Textile Research Laboratory in Geelong. The Executive of CSIR failed to find a Chief of Division and decided to set up three separate laboratories in Sydney, Melbourne and Geelong. I was reluctant about applying for the position in Geelong because I never had great ambitions to be Head of a laboratory. I wanted to get on with the laboratory work, do science and not just administration. I thought I better apply lest someone be appointed above me who I didn’t respect. I recall asking Speakman to be a referee, to which he agreed but protested, writing to CSIR that the position should have been offered to me without advertising it. The rest of my career was in Geelong, building up this Division. We were involved in mechanical processing such as carding, combing, spinning and wet processes such as scouring, dyeing, shrink proofing and setting. It could have required engineers and textile technologists but we were mainly taking on chemists and physicists. It was hard to get people to come to Geelong initially because Melbourne and Sydney had the universities and after graduating people would stay there. We had to entice people to come to Geelong. Houses were built not far from the laboratories and were rented to staff as an enticement. We had to put up scholarships for Australians to be sent overseas after they’d worked for us for a while. We had to battle quite a while to get plenty of staff. Our laboratory site included a small textile mill so we could go from the greasy wool right through to the final fabric and garment. We’d get wool from other laboratories where they wanted to find out if certain things they were doing to increase wool production were making differences to the processing performance. We could show that even if the wool looked different in the greasy state, the final processing performance was quite satisfactory, sometimes even better. We did work on the effect of parasites on the wool and the effects of fleece rot on processing. Fleece rot makes the fleece look brown and it was concluded that this wool had deteriorated, so buyers were knocking back the price of the wool. We found that fleece rot is not damaging the wool fibres. The brown colouration goes when you wash the fleece, and it processes satisfactorily. When I was at the Central Wool Committee we received complaints back from Bradford about the ‘tar’ used by growers to brand sheep not scouring out. After coming back to Geelong I took this up further and it ultimately led to what we call Siromark® branding fluid. Over the years, Siromark® saved the industry millions because it was no longer necessary to clip off the branded section or treat the final fabric with solvents. I suppose establishing the Division in Geelong might be my greatest career achievement. There were many others involved in the work undertaken so I don’t take individual credit for that sort of thing. Building up a team is the thing. I attribute my success to a certain amount of determination, a bit of ingenuity and a “little low cunning” to cut red tape. I find it difficult to speak of other professional people who have greatly influenced me. Various people have played a part as Speakman did, although I didn’t agree entirely with all his views. 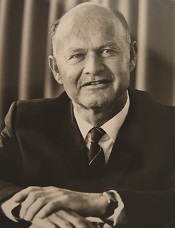 Menzie Lipson retired as Chief CSIRO Division of Textile Industry in 1976. During his term as O-i-C and Chief of Division the Geelong laboratory was involved in many commercial developments. These are described in Vince Williams book From Fleece to Fabric: 1948-98 – Fifty Years of Wool Textile Research published by CSIRO in 1997. There are textile manufacturing plants operating around the world using sophisticated processes developed at the Geelong laboratory during his years as head of the Laboratory. Following his retirement he returned to his old Division of Animal Health where, as a Senior Research Fellow, his interest in chemistry continued. Under this arrangement he worked as a Deakin University Fellow on fleece chemistry related to sheep blowfly problems for nine years until 1985. I was one of the foundation members of the University for Geelong Committee and we worked for years to get a university in Geelong. When they set up Monash we put up a case but we didn’t get it and again we missed out when they selected La Trobe. At that time Phillip Law was Chairman of the Site Committee. He came out on a Saturday morning, beautiful sunshine out on the bay, it looked so attractive. He said “This is the best site I’ve seen in Victoria, but you won’t get it, it’s got to go to Melbourne”. That discouraged us a little bit but he was pretty honest about it. After a battle we finally got our university. He was a Member of the Council of the Gordon Institute, Geelong and a member of the Council of the Marcus Oldham Farm Management College from 1980 to 1996. His contributions to local industry was acknowledged by Oberon High School, Belmont with a house name, ‘Lipson House’ and an annual science award to encourage students to pursue studies in science. A man of great social conscience, Menzie Lipson set up Sirovilla for the active elderly in Geelong. He worked tirelessly for Rotary for 51 years serving as President in 1965-66. He undertook various Landcare projects. He supported many charities throughout the community including Community Aid Abroad where he was a long time participant in annual Walks Against Want. an Honary Life Member of the National Wool Museum in Geelong. Australian wool textile research lost one of its primary figures with his death on 9 November 2004. He was 89 years old. Lipson M, 2003, Australian Academy of Technological Sciences and Engineering – interviews with Foundation Fellows. Williams VA, 1998, From Fleece to Fabric: 1948-1998 – Fifty Years of Wool Textile Research, CSIRO Wool Technology, Geelong, Victoria, Australia, pp.198. Who’s Who in Australia, editions 1983-2004.